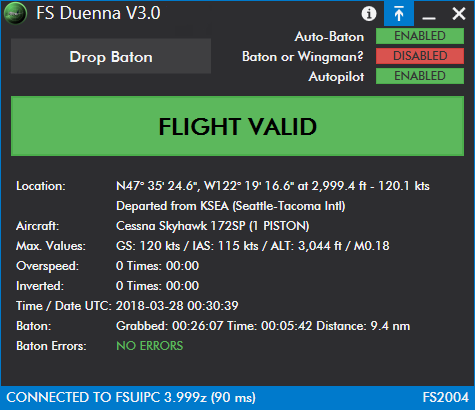 The FS-Duenna is a tool used to validate flights primarily used during the Flight Simulator Round the World race. The tool was originally written by Johannes Mueller (http://johannesmueller.com/), however with recent release of Flight Simulator: Steam Edition and Lockheed Martin Prepar3D, the tool needed updates. The tool was handed over to Eamonn Watson for further development. The tool monitors flight simulator while you fly for possible violations (eg. Time acceleration / re-fuelling / crashing / etc). When you have completed your flight it then creates a text file and validation graphic that can be used to summarize the flight and outline any violations. The Duenna has a small footprint and will run happily in the background while you fly.